March 9, 2017, 5:27 PM · Shinichi Suzuki certainly changed the landscape, when it comes to teaching children to play the violin and other instruments. At the same time, many of the things that he was doing were already being done, or have been revised by those who still hold to his philosophy. This was one of many ideas brought forth during a workshop at the Colburn Center with violinist Mark Bjork. Bjork, who retired last year from his longtime post as professor of Violin and Pedagogy at the University of Minnesota School of Music, also started one of the first Suzuki programs in the U.S., in 1967 at the MacPhail Center for Music. The workshop was sponsored by Suzuki Music Association of California, which presents a teacher workshop every other year on Presidents' Day weekend. Bjork has some fascinating perspectives and ideas about teaching, having personally studied with both Josef Gingold, at Indiana University, and with Shinichi Suzuki, whose teaching he observed on a daily basis for four months in Matumoto in the early '70s. Bjork painted a picture of where things stood at the beginning of his own career, in the 1960s, when certain stereotypes prevailed about teaching the violin to young children. The widespread use of the Suzuki method has changed many of those preconceptions. As a violin teacher myself, with a music degree as well as Suzuki pedagogy training registered through Book 10, I don't reject everything listed above. For example, I believe scales and etudes play a crucial role in learning (as does Bjork, who uses etudes in his teaching). It worth noting that, in just about every level of Suzuki pedagogy training that I did, we looked at appropriate etudes to pair with the Suzuki repertoire. Also, I can't say it's a bad idea to learn piano as well as violin, though it's not what I'd call a "necessity." I can also vouch for the fact that the entire Suzuki contingent has embraced learning reading at an early stage; ineffective instruction in reading was a weakness of the early Suzuki movement in the U.S., but the community has more than compensated, producing some of the most creative and effective methods around for learning note reading and music theory as a young child. But when it comes to other items on the list, 50+ years of the Suzuki method have all but proved many of them wrong. For example, children do not need to wait until age 10 to begin learning the violin. Suzuki popularized the idea of beginning very early, as in age five or before. This idea was not new; after all, Jascha Heifetz started violin at age two! But certainly Suzuki made the idea much more mainstream. How about the idea that talent is inherited? Suzuki explicitly required no "talent test" to join his studio, as many music schools once had. He taught anyone who wished to play, and he encouraged other teachers to do the same. Suzuki famously believed that every child has innate ability that can be -- and should be -- cultivated with a nurturing and music-rich environment. Bjork offered this definition of "talent": "Musical ability, or 'talent,' is evidence of the acquisition of a complex array of skills derived from environmental stimuli." In other words: the skills are acquired, not inborn. And "in order to play well, you have to have X amount of skills, but you don't have to acquire them in a certain order or in a certain way," Bjork said. Here's a related idea that also doesn't hold up: that you can tell, when a student walks in the door for the first lesson, whether or not he or she will do a good job. Certainly most Suzuki teachers would not agree, nor would anyone who has taught for a long period of time. Many students who seem hopelessly untalented at their first lessons will work hard and turn into fine musicians. And those who seem talented in the beginning will grow only with practice and persistence; sometimes they aren't inclined to put work and thus don't get far. As far as the violin being a "difficult" instrument, "if you present it as difficult, it will be," Bjork said. These days, people don't think the violin is "too hard" for a child to learn. 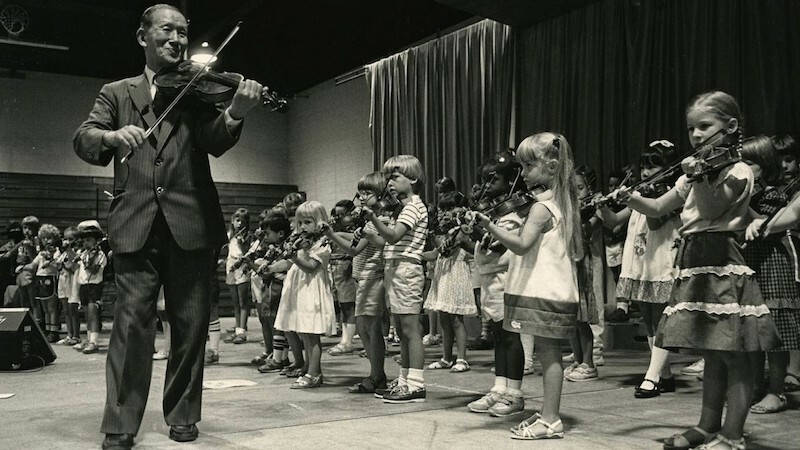 One reason is that, thanks to the Suzuki method, the tiny child playing the violin is not nearly the rarity as it was 50 years ago, so we don't view it as being a major miracle when they learn to play. The idea that children need "childish music" -- this was before my time, but teachers used to routinely assign pieces that were particularly manufactured for violin learning, rather than pieces with high artistic merit, he said. Bjork told the story of his own childhood, when his teacher continually said he was not ready or mature enough to play "real music." Instead, "I played every little student concerto known to man -- for example, the Kuchler Concerto. Why not Vivaldi?" Suzuki rejected that idea; "Suzuki said, we'll use good music!" Bjork said. Shinichi Suzuki. From the Suzuki Association of the Americas. Suzuki's use of repertoire such as folk music, Bach, Mozart, Vivaldi and other composers comes from an insistence on using "real music." Take real music, and organize it in a way that is progressive and helpful for learning, but don't serve up "student music" that lacks artistic or cultural merit. Kids can tell the difference. The idea that listening to recordings will somehow be detrimental also has been largely rejected. These days nearly every method book sold to schools comes with a recording. Why? "Because it works," Bjork said. The many and diverse artists who have emerged from the Suzuki method (Leila Josefowicz, Hilary Hahn, Anne Akiko Meyers, Regina Carter, Lara St. John, Jennifer Koh, Nicola Benedetti, Ray Chen, Frank Almond, Brian Lewis, William Preucil, Jr., Martin Chalifour, to name just a few) -- are a testament to the fact that they did not turn out to be "robots"! Perhaps the most uniquely-Suzuki idea was his "Mother Tongue" approach, his philosophy that all children can learn musical fluency in the way they learn to speak their native language. All his ideas -- start early, repeat things, do things as a group, listen before learning -- stemmed from this approach. But the idea applies to more than beginners; it also applies to students who have moved beyond the Suzuki books. "It's not a pre-'real lesson' method," said Bjork, who has written a book on the more advanced student called Expanding Horizons: The Suzuki-Trained Violinist Grows Up. Children's early efforts at speaking involve a great deal of "parroting" what they hear from the people around them. "But then the individuality and thought processes start to develop," Bjork said. Just as adolescents and young adults learn to speak their own ideas through their acquired language, so does the violinist discover his or her own expressive capacities on the violin. Mark Bjork: Does It Hurt When You Play? It's a long and diverse list, and I have not even begun to include everyone! March 10, 2017 at 07:19 AM · And arent many other violinists been started with suzuki too? March 10, 2017 at 01:37 PM · Do some people still oppose the Suzuki methods ? March 11, 2017 at 01:45 AM · Is singing a part of the Suzuki method at all? March 11, 2017 at 06:19 AM · Yes, singing is encouraged and widely practiced. 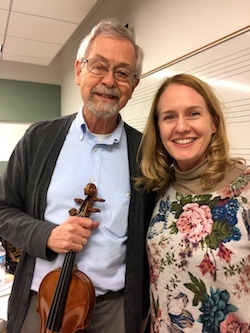 March 12, 2017 at 09:59 PM · I was an early Suzuki student, having started at age five in Alice Joy Lewis's very first Suzuki class ever--we did pre-violin exercises in the fall of 1966, and first got to hold our violins in early 1967. I don't know about the other children in the class, but Alice Joy began giving me private lessons in addition to the group class fairly early on, and I was definitely reading music well before I was out of Listen and Play book two (equivalent to the second half of Suzuki Violin School book one). My Suzuki experience was limited by my family's move from Kansas to Maryland when I was eight--I would say unfortunately, except that my next violin teacher was Doris Gazda. I was extraordinarily lucky as a young student. March 13, 2017 at 10:11 AM · I wish Suzuki also change a perspective on learning exact sciences! To do my math becomes harder and harder! March 16, 2017 at 09:25 PM · This is a timely thread. I was taught by the traditional way. My 5yr old son needs to start violin. I have been debating whether or not to send him to a Suzuki method for the last 2 yrs! For those who know the two camps well, Will you send your own child to a Suzuki based program or a traditional program?